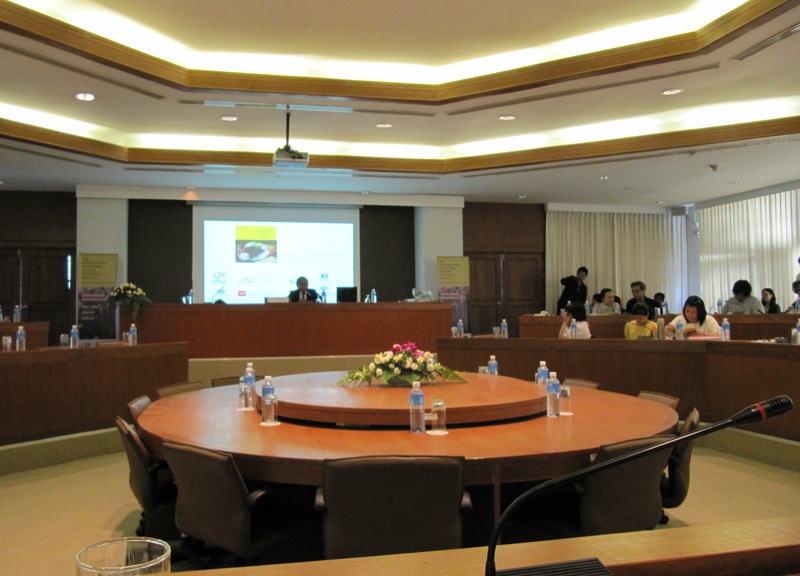 Silpakorn University recently hosted the 3rd APTCCARN (Asia Pacific Twentieth Century Conservation Art Research Network) Meeting in Nakhon Pathom at the end of April 2012. 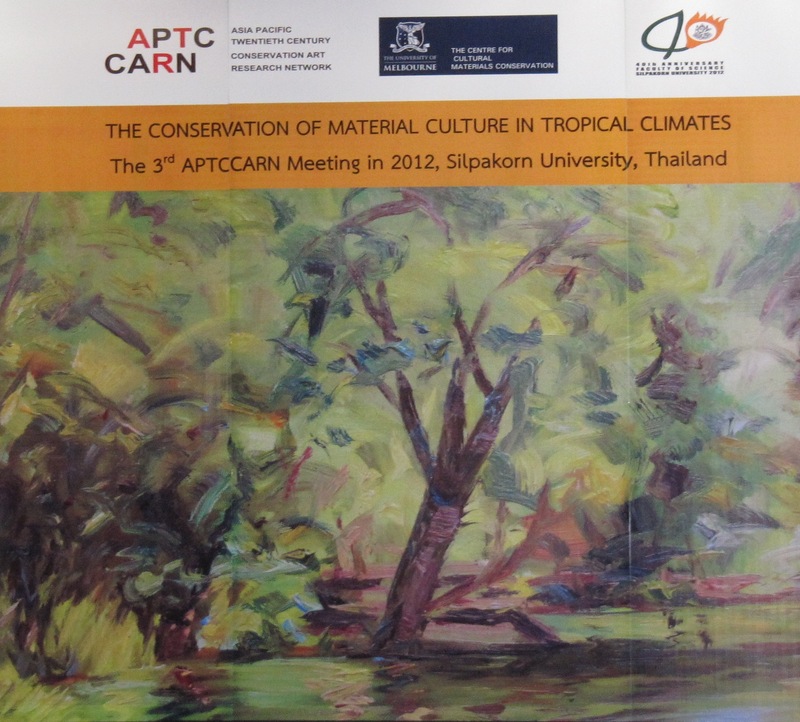 The conference covered a broad range of topics relevant to the conservation of material culture in tropical climates. Talks were given on three main topics: artists’ materials and materiality, conservation practice and communicating conservation. Some of the presentations dealt with issues relating to preventive conservation, conservation case studies, textile conservation, wallpainting conservation, manuscript conservation and paint production, among others. I presented a paper together with Michael Schilling on Vietnamese lacquer painting, which provided the audience with an overview of the production of Vietnamese lacquer paintings, followed by a description of the first analytical results of our collaborative research project on Vietnamese lacquer painting with the Getty Conservation Institute. Feedback and interest in the talk was very positive. The conference also included a panel discussion by Thai artists on materials and materiality, as well as several site visits. 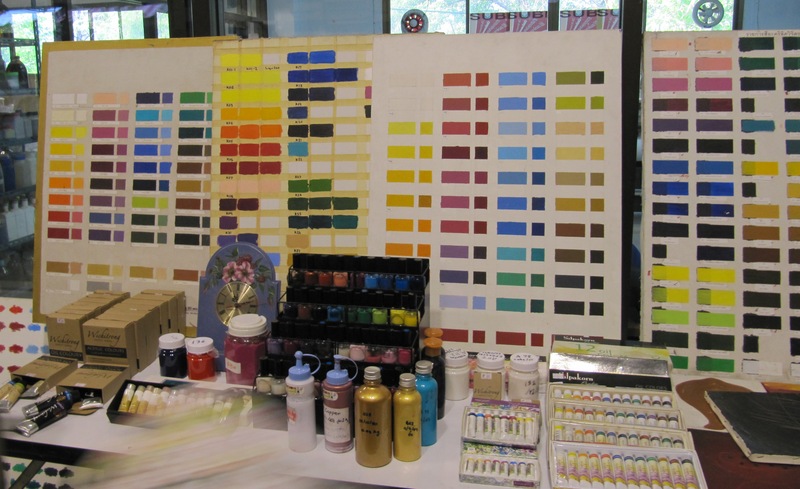 It was fascinating to obtain a behind-the-scenes view of paint production at the Material Research Centre for Art and Design at Silpakorn University. Here, they have conducted extensive research into, and are producing paints specifically for use in tropical climates. The conference was a great opportunity to hear more about what other conservators in the Asia Pacific region are working on. We are looking forward to the postprints, which will be published in a peer-reviewed book. And then travelling to Hoi An where I was exposed to Contemporary ‘Lacquer paintings’. And now, because of this exposure, I want to investigate more. I’m hoping to do a masters at UWA – I’d like to investigate photo montage and lacquer painting. I’m wondering do you have any information on this technique? I’d love any information you can offer. I am guessing you are looking more for information about the actual painting process. If you are looking for books, then there is not that much written on the subject. There is a short booklet published in French, English and Vietnamese by Nguyen Dang Quang, called Vietnamese Lacquerware. A couple of websites have some information online. Thanks so much for your reply and information given. Yes, I agree not much information available at all. But you mentioned: There is a short booklet published in French, English and Vietnamese by Nguyen Dang Quang, called Vietnamese Lacquerware. How can I buy the book? Do you know? Vietnamese books tend to be published in limited editions, and are usually only available in Vietnam. The only thing I could suggest is trying abebooks or ebay, there might be a book available there. Otherwise, on your next trip to Vietnam, visit the bookshops and museum shop! university)and I am interested in the paper conservation field i have a scholarship and the fund to study in abroad ,to complete my study for fulfillment of PhD in conservation could you help me to complete my study under the supervision of prof in the field of paper conservation could you reply with the acceptance in a short time please. I am afraid we do not offer PhD support in paper conservation. I suggest you get in touch with some of the universities which teach conservation, depending on which country you want to be based in. There should be several options available to you. I’m trying to find some sources for a paper I’m writing on preventive conservation in museums in tropical climates. Could you recommend any? I’ve found a few with regards to library archives in tropical environments. However, I’m having difficulty locating articles about museum collections. Any assistance that could steer me in the right direction would be greatly appreciated. Vinod Daniel, Colin Pearson, Ivan Cole, Wayne Ganther and Steve King, Behaviour of museum buildings in tropical climates, pp.45-50, Tradition and Innovation, Advances in Conservation, Contributions to the Melbourne Congress, 10-14 October 2000, IIC. Have you checked ICOM-CC Triennial postprints? I would imagine that to be the most likely source for additional papers. Thank you so much for your suggestions! They have been a helpful addition to my paper. I hadn’t thought to check the Triennial postprints, thank you.